Tooth sensitivity is a common issue that many of us face. It can be tough or disappointing to avoid foods like ice cream that can trigger your sensitivity. 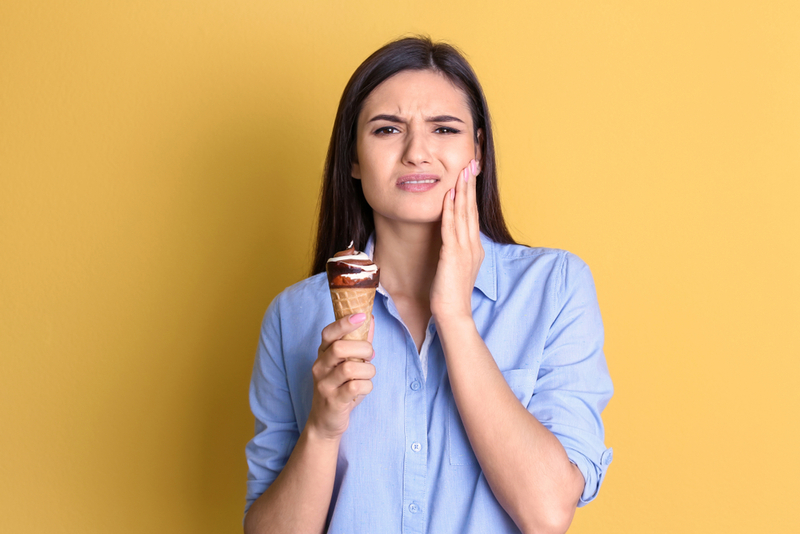 However, knowing more about the causes of sensitive teeth and what you can do to improve your condition is the key to reducing (or even eliminating) the issue. Today, we’ve compiled a list of things you can do to reduce the sensitivity of your teeth. Brushing harder can feel like it’s doing a better job of cleaning your teeth. But that actually isn’t the case. When we’re brushing our teeth, we’re aiming to remove plaque, which is a soft, sticky substance made up of bacteria, food and saliva. Because it is soft, it can be removed by gentle brushing. Left for as little as a week, plaque can harden and become tartar. Tartar is extremely hard and can only be removed by a dentist’s scaler. This is where the misconception lies; many people believe they are trying to remove tartar. Moreover, brushing too hard can actually wear down the thin layer of gums that sit between and just over your teeth. Worn down gums will tend to recede and not grow back. This causes nerve endings to become exposed, triggering tooth sensitivity. To improve your sensitive teeth, invest in a softer-bristled brush. Brush with a lighter hand and tiny circular motions that reach the gum line. Ensure you’re flossing as well to remove the extra plaque that the brush cannot reach. There are many types of toothpaste on the market that are made for sensitive teeth. Often, these formulas contain potassium nitrate. This key ingredient helps to cover the microscopic holes in your teeth that cause sensitivity by exposing the nerves. Mouthwashes meant for sensitive teeth or those that are high in fluoride can also help to alleviate the sensitivity you’re experiencing. The coat of fluoride helps protect and your enamel by slowing down the process of its breakdown and speeding up remineralisation. As a bonus, mouthwash can also kill the bacteria that cause a host of other dental issues. Consuming food and drinks with high levels of acidity weaken your enamel. Over time, this can leave your teeth prone to sensitivity. Brushing too soon after eating acidic foods can also further damage your enamel. Some of these items on the list, such as citrus fruits, are healthy foods that you may still want to consume. Having them along with a glass of water, or as part of a larger meal that is low in acidity can help to neutralise the acids and lessen the effects they have on your teeth. Teeth grinding (or bruxism) is defined by the Australian Dental Association (ADA) as “involuntary clenching, grinding and gnashing of the teeth”. Often, teeth grinding can happen in your sleep, which means that it often goes unidentified until more serious issues start to appear. In waking hours, it can still go undetected as it usually happens subconsciously. Teeth grinding is a common cause of sensitive teeth because it slowly wears down the enamel. This exposes nerves in your teeth and makes them more reactive to fluctuations in temperature. There are a few different ways you can tackle the issue of teeth grinding. One is to visit your dentist and organise to have a custom-made mouth guard created for your teeth. Wearing a mouth guard to bed prevents tooth grinding and therefore reduces further harm to your teeth and enamel. The best way to treat sensitive teeth is of course to visit your dentist. Your dentist can properly assess your condition and go on to recommend the appropriate treatments, which are more intensive than simple home remedies. If you’re suffering from sensitive teeth, Eden Rise Dental can advise you on management techniques to reduce and eliminate the problem. We are a Berwick dental clinic dedicated to giving everyone the smile they deserve. Please don’t hesitate to give us a call today on (03) 9702 6111 and schedule your consultation today.